, czar of Russia, who civilized that nation, and raised it from ignorance and barbarism, to politeness, knowledge, and power, a man of a wonderful composition and character, was born the 30th of May, 1672, and was son of the czar Alexis Michaelowitz by a second wife. Alexis dying in 1672, Feodor, or Theodore, his eldest son by his fivst wife, succeeded to the throne, and died in 1682. Upon his decease, Peter, though but ten years of age, was proclaimed czar, to the exclusion of John his elder brother, who was of a weak body, and a weaker mind. 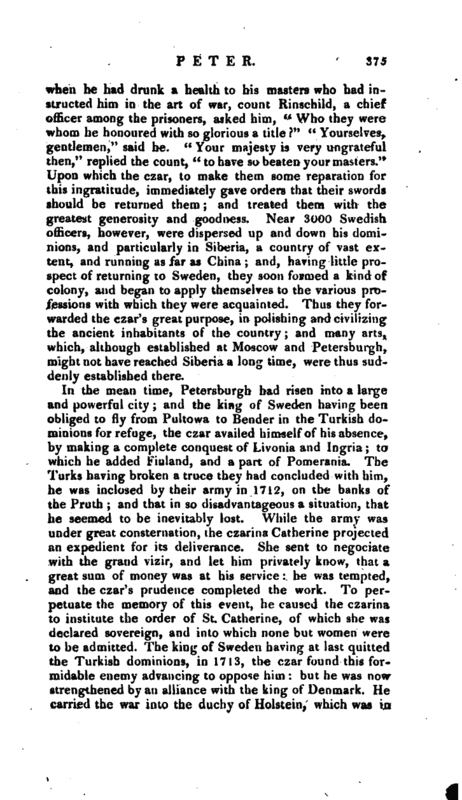 The strelitzes, who were the established guard of the czars, as the janisaries are of the grand seigniors, made an insurrection in favour of John, at the instigation of the princess Sophia, who, being own sister to John, hoped, perhaps, to be sole regent, since John was incapable of acting; or at least to enjoy a greater share of authority under John, than if the power was lodged solely in her half-brother Peter. The matter, however, was at last compromised; and it was agreed, that the two brothers should jointly share the imperial dignity. 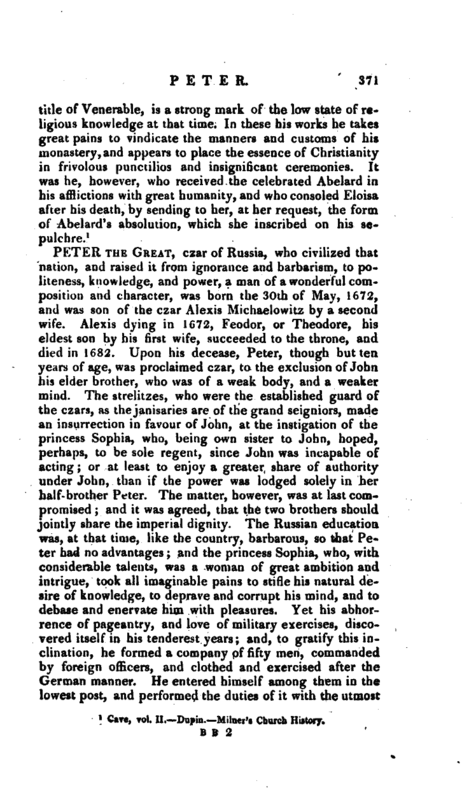 The Russian education was, at that time, like the country, barbarous, so that Peter had no advantages; and the princess Sophia, who, with considerable talents, was a woman of great ambition and intrigue, took all imaginable pains to stifle his natural desire of knowledge, to deprave and corrupt his mind, and ta debase and enervate him with pleasures. Yet his abhorrence of pageantry, and love of-military exercises, discovered itself in his tenderest years; and, to gratify this inclination, he formed a company of fifty men, commanded by foreign officers, and clothed and exercised after the German manner. He entered himself among them in the lowest post, and performed the duties of it with the utmost | diligence. He ordered them entirely to forget that he was czar, and paid the utmost deference and submission to the commanding officers. He lived upon his pay only, and lay in a lent in the rear of his company. He was some time after raised to be a serjeant, but only as he was entitled to it by his merit; for he would have punished his soldiers, had they discovered the least partiality in his favour: and he never rose otherwise, than as a soldier of fortune. The strelitzes looked upon all this as the amusement of a young prince: but the czar, who saw they wer too formidable, and entirely in the interest of the princes Sophia, had secretly a design of crushing them; which he wisely thought could not be better effected, than by securing to himself a body of troops, more strictly disciplined, and on whose fidelity he could more fully rely. See “An Account of the Rise and Naval Power of Russia, or, the story of the little Boat which gave rise to the Russian Fleet,” said to be written by the czar Peter himself, and printed in the second volume of “The Present State and Regulations of the Church of Russia.” By Tho. Consett M. A. | of too new and singular a nature to be so much as considered in his council, nor were they proper to he communicated. He resolved therefore singly to manage this bold undertaking; with which view, in 1698, he sent an embassy to Holland, and went himself incognito in the retinue. He entered himself in the India admiralty-office at Amsterdam, caused himself to he inrolled in the list of ship-carpenters; and worked in the yard with greater assiduity than any body there. His quality was known to all; and he was pointed at with a sort of veneration. King William, who was then in Holland, paid him all the respect that was due to his uncommon qualities; and the czar’s disguise freed him from that which was merely ceremonious and troublesome. The czar worked with such success, as in a little time to pass for a good carpenter; and afterwards studied the proportions of a ship. 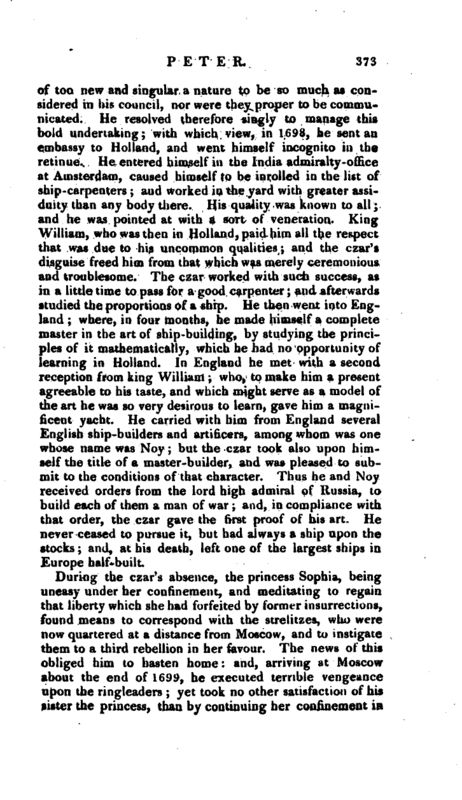 He then went into England; where, in four months, he made himself a complete master in the art of ship-building, by studying the principles of it mathematically, which he had no opportunity of learning in Holland. In England he met with a second reception from king William; who, to make him a present agreeable to his taste, and which might serve as a model of the art he was so very desirous to learn, gave him a magnificent yacht. He carried with him from England several English ship-builders and artificers, among whom was one whose name was Noy; but the C2ar took also upon himself the title of a master-builder, and was pleased to submit to the conditions of that character. Thus he and Noy received orders from the lord high admiral of Russia, to build each of them a man of war; and, in compliance with that order, the czar gave the first proof of his art. He never ceased to pursue it, but had always a ship upon the stocks; and, at his death, left one of the largest ships in Europe half-built. During the czar’s absence, the princess Sophia, being uneasy under her confinement, and meditating to regain that liberty which she had forfeited by former insurrections, found means to correspond with the strelitzes, who were now quartered at a distance from Moscow, and to instigate them to a third rebellion in her favour. The news of this obliged him to hasten home: and, arriving at Moscow about the end of 1699, he executed terrible vengeance upon the ringleaders yet took no other satisfaction of his sister the princess, than by continuing her confinement in | the nunnery, and hanging up the priest, who had carried her letters, on a gallows before her window. In 1700, he got together a body of standing forces, consisting of thirty thousand foot; and now the vast project which he had formed began to display itself in all parts. 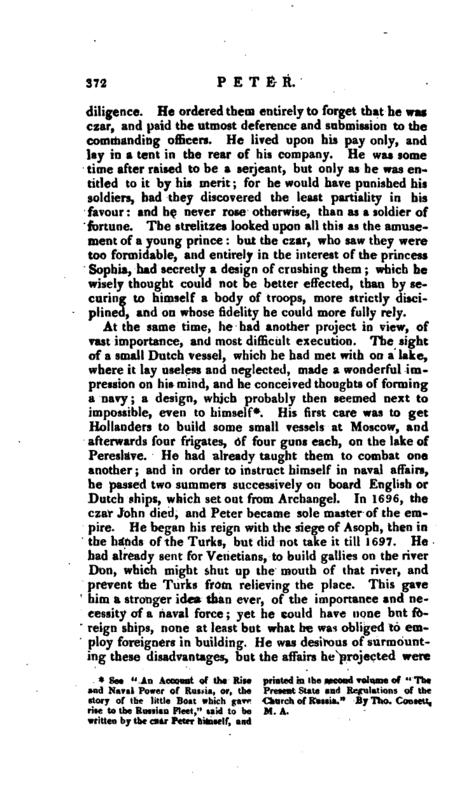 He first sent the chief nobility of his empire into foreign countries, to improve themselves in knowledge and learning: he opened his dominions, which till then had been shut up, and invited all strangers who were capable of instructing his subjects; and he gave the kindest reception to all land and sea officers, sailors, mathematicians, architects, miners, workers in metals, physicians, surgeons, and indeed operators and artificers of every kind, who would settle in his dominions. In the mean time, he had to do with a dull, fceavy, untoward people; so that it is no wonder, that proceedings so new and strange should raise many discontents and tumults, apd it was sometimes almost impossible with all his power to suppress them. One very singular reason, on which these discontents were grounded, was, that the Russians considered grandeur and superiority, the czar’s great object, in no other light than as a power of doing evil. In 1700, being strengthened by an alliance with Augustus king of Poland, he made war upon Charles XII. 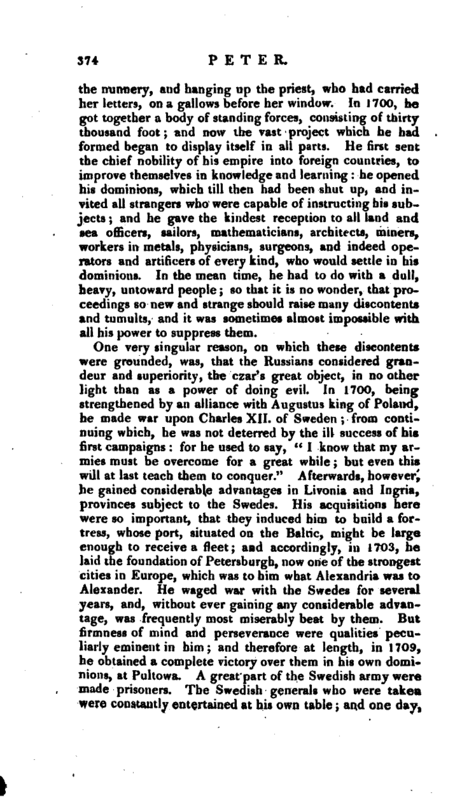 of Sweden; from continuing which, he was not deterred by the ill success of his first campaigns: for he used to say, “I know that my armies must be overcome for a great while; but even this will at last teach them to conquer.” Afterwards, however, he gained considerable advantages in Livonia and Ingria, provinces subject to the Swedes. His acquisitions here were so important, that they induced him to build a fortress, whose port, situated on the Baltic, might be large enough to receive a fleet; and accordingly, in 1703, he laid the foundation of Petersburgh, now one of the strongest cities in Europe, which was to him what Alexandria was to Alexander. He waged war with the Swedes for several years, and, without ever, gaining any considerable advantage, was frequently most miserably beat by them. But firmness of mind and perseverance were qualities peculiarly eminent in him; and therefore at length, in 1709, he obtained a complete victory over them in his own dominions, at Pultowa. A great part of the Swedish army were made prisoners. The Swedish generals who were takeu were constantly entertained at his own table and one day, | when he had drunk a health to his masters who had instructed him in the art of war, count Rinschild, a chief officer among the prisoners, asked him, “Who they were whom he honoured with so glorious a title?” “Yourselves, gentlemen,” said he. “Your majesty is very ungrateful then,” replied the count, “to have so beaten your masters.” Upon which the czar, to make them some reparation for this ingratitude, immediately gave orders that their swords should be returned; them and treated them with the greatest generosity and goodness. 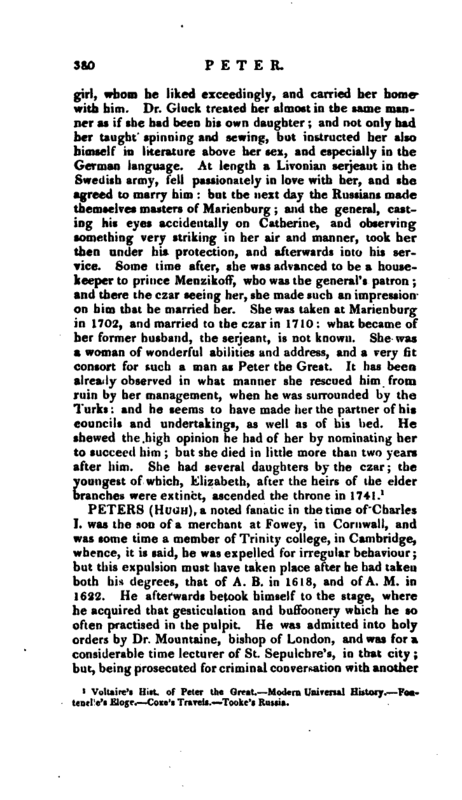 Near 3000 Swedish officers, however, were dispersed up and down his dominions, and particularly in Siberia, a country of vast extent, and running as far as China; and, having little prospect of returning to Sweden, they soon formed a kind of colony, and began to apply themselves to the various professions with which they were acquainted. Thus they forwarded the czar’s great purpose, in polishing and civilizing the ancient inhabitants of the country; and many arts, which, although established at Moscow and Petersburgh, might not have reached Siberia a long time, were thus suddenly established there. In the mean time, Petersburgh had risen into a large and powerful city; and the king of Sweden having been obliged to fly from Pultowa to Bender in the Turkish dominions for refuge, the czar availed himself of his absence, by making a complete conquest of Livonia and Ingria to which he added Finland, anda part of Pomerania. The Turks having broken a truce they had concluded with him, he was inclosed by their army in 1712, on the banks of the Pruth; and that in so disadvantageous a situation, that he seemed to be inevitably lost. While the army was under great consternation, the czarina Catherine projected an expedient for its deliverance. She sent to negociate with the grand vizir, and let him privately know, that a great sum of money was at his service: he was tempted, and the czar’s prudence completed the work. To perpetuate the memory of this event, he caused the czarina to institute the order of St. Catherine, of which she was declared sovereign, and into which none but women were to be admitted. The king of Sweden having at last quitted the Turkish dominions, in 1713, the czar found this formidable enemy advancing to oppose him: but he was now strengthened by an alliance with the king of Denmark. He carried the war into the duchy of Holstein, which was is | alliance with the Swedes; and, in 1714, obtained over them a victory at sea, near the coasts of Finland, upon which he entered triumphantly with his fleet into the haven of Petersburgh. All this while he continued his pursuits after all kinds of knowledge. He caused his engineers to draw the plan of every city, and to take designs of all the different machines which he had not in his own country. He instructed himself in husbandry, and in all sorts of trade, wherever he came. In 1716, he paid a visit, with his consort, to the king of Denmark at Copenhagen, where he spent three months. He visited there every school of the university, and all the men of letters: for, regardless of ceremony and pageantry, which he hated, it was indifferent to him, whether they waited on him, or he went to them. He coasted every day some part of the kingdoms of Denmark and Sweden, attended by two engineers; surveyed all the windings, sounded every part of the straits, and afterwards had the whole so exactly described in charts, that not so much as the smallest shelf or bank of sand escaped his observation. From Copenhagen he went to Hamburgh, Hanover, Wolfenbuttle, and from thence to Holland. 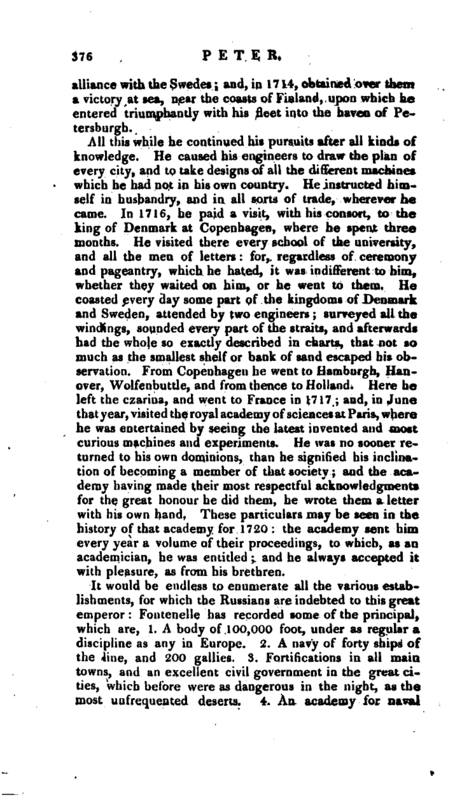 Here he left the czarina, and went to France in 1717; and, in June that year, visited the royal academy of sciences at Paris, where he was entertained by seeing the latest invented and most curious machines and experiments. He was no sooner returned to his own dominions, than he signified his inclination of becoming a member of that society; and the academy having made their most respectful acknowledgments for the great honour he did them, he wrote them a letter with his own hand. These particulars may be seen in the history of that academy for 1720: the academy sent him every year a volume of their proceedings, to which, as an academician, he was entitled; and he always accepted it with pleasure, as from his brethren. It would be endless to enumerate all the various establishments, for which the Russians are indebted to this great emperor: Fontenelle has recorded some of the principal, which are, 1. A body of 100,000 foot, under as regular a discipline as any in Europe. 2. A navy of forty ships of the line, and 200 gallies. 3. Fortifications in all main towns, and an excellent civil government in the great cities, which before were as dangerous in the night, as the most unfrequented deserts. 4. An academy for naval | affairs and navigation, where all the nobility are obliged to send some of their children. 5. Colleges at Moscow, Petersburgh, and Kiof, for languages, polite literature, and mathematics; and schools in the villages, where the children of the peasants are taught to read and write. 6. A college of physicians, and a noble dispensatory at Moscow, which furnishes medicines to the great cities, and to the armies; whereas before there was no physician but the czar’s, and no apothecary in all his dominions. 7. Public lectures in anatomy, a word never heard before in Russia. 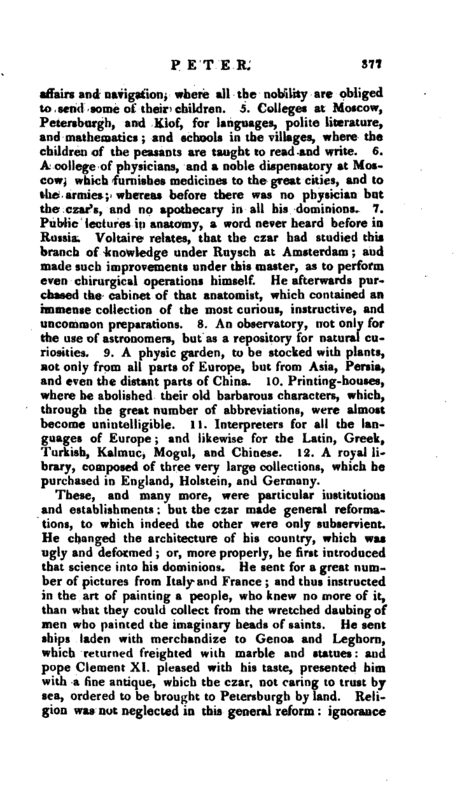 Voltaire relates, that the czar had studied this branch of knowledge under Ruysch at Amsterdam; and made such improvements under this master, as to perform even chirurgical operations himself. He afterwards purchased the cabinet of that anatomist, which contained an immense collection of the most curious, instructive, and uncommon preparations. 8. An observatory, not only for the use of astronomers, but as a repository for natural curiosities. 9. A physic garden, to be stocked with plants, not only from all parts of Europe, but from Asia, Persia, and even the distant parts of China. 10. Printing-houses, where he abolished their old barbarous characters, which, through the great number of abbreviations, were almost become unintelligible. 11. Interpreters for all the languages of Europe; and likewise for the Latin, Greek, Turkish, Kalmuc, Mogul, and Chinese. 12. A royal library, composed of three very large collections, which he purchased in England, Holstein, and Germany. These, and many more, were particular institutions and establishments: but the czar made general reformations, to which indeed the other were only subservient. He changed the architecture of his country, which was ugly and deformed; or, more properly, he first introduced that science into his dominions. He sent for a great number of pictures from Italy and France; and thus instructed in the art of painting a people, who knew no more of it, than what they could collect from the wretched daubing of men who painted the imaginary heads of saints. He sent ships laden with merchandize to Genoa and Leghorn, which returned freighted with marble and statues: and pope Clement XI. pleased with his taste, presented him with a fine antique, which the czar, not caring to trust by sea, ordered to be brought to Petersburgh by land. Religion was not neglected in this general reform ignorance | and superstition had over-run it so much, that it scarcely merited the name of Christian. The czar introduced knowledge, where it was miserably wanted; and this knowledge enabled him to abolish, at least in a considerable degree, fasts, miracles, and saint-worship. He ventured further than to the correction of rites: he abolished the patriarchate, though much independent of him; and thus got rid of a power, which was always interrupting and disconcerting his measures. He took away part of the revenues of those churches and monasteries which he thought too wealthy; and, leaving only what was necessary for their subsistence, added the overplus to his own demesnes. He made many judicious ecclesiastical canons, and ordered preaching in the Russian language. Lastly, he established a general liberty of conscience throughout his dominions. There is one more reformation, and perhaps as necessary and useful as any of the former, which he made even in his last illness, though it was exceedingly painful. 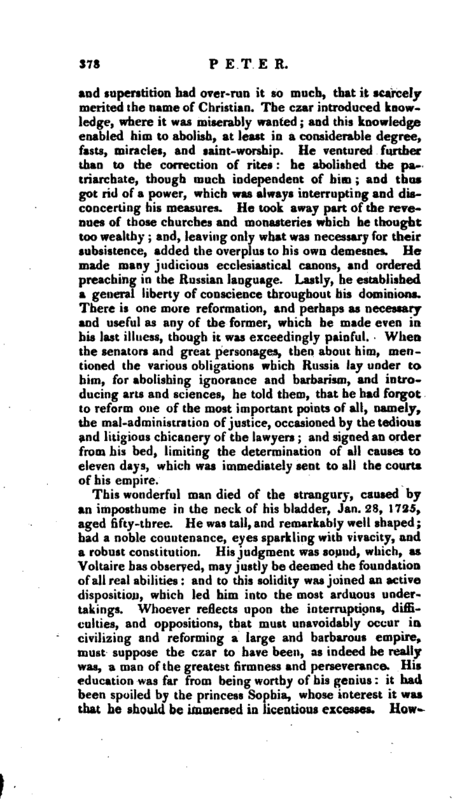 When the senators and great personages, then about him, mentioned the various obligations which Russia lay under to him, for abolishing ignorance and barbarism, and introducing arts and sciences, he told them, that he had forgot to reform one of the most important points of all, namely, the mal-administration of justice, occasioned by the tedious and litigious chicanery of the lawyers; and signed an order from his bed, limiting the determination of all causes to eleven days, which was immediately sent to all the courts of his empire. This wonderful man died of the strangury, caused by an imposthume in the neck of his bladder, Jan. 28, 1725, aged fifty-three. He was tall, and remarkably well shaped; had a noble countenance, eyes sparkling with vivacity, and a robust constitution. His judgment was sound, which, as Voltaire has observed, may justly be deemed the foundation of all real abilities: and to this solidity was joined an active disposition, which led him into the most arduous undertakings. Whoever reflects upon the interruptions, difficulties, and oppositions, that must unavoidably occur in civilizing and reforming a large and barbarous empire, must suppose the czar to have been, as indeed he really was, a man of the greatest firmness and perseverance. His education was far from being worthy of his genius: it had been spoiled by the princess Sophia, whose interest it was that he should be immersed in licentious excesses. | Howfever, in spite of bad example, and even his own strong propensity to pleasure, his natural desire of knowledge and magnanimity of soul broke through all habits; nay, they broke through something even greater than habits. It is remarkable, that from his childhood he had such a dread of water, as to be seized with a cold sweat and with convulsions, even in being obliged to pass over a brook. The cause of this aversion is thus related: When he was about five years of age he was carried in the spring season over a dam, where there was a water-fall or cataract. He was asleep in his mother’s lap, but the noise and rushing of the water frightened him so much that it brought on a fever and, after his recovery, he retained such a dread of that element, that he could not bear to see any standing water, much less to hear a running stream. Yet such was the force of his resolution, that he gradually conquered this antipathy, and his aversion of water was afterwards changed into an excessive fondness for that element. He had a son who lived to be a man; but this son engaging with his mother, whom Peter had divorced in 1692, and other malcontents, in a conspiracy against his father in 1717, was condemned to die. He saved the executioners the trouble by dying a natural death; and an account of this unfortunate prince, with original papers, was published by the czar himself. 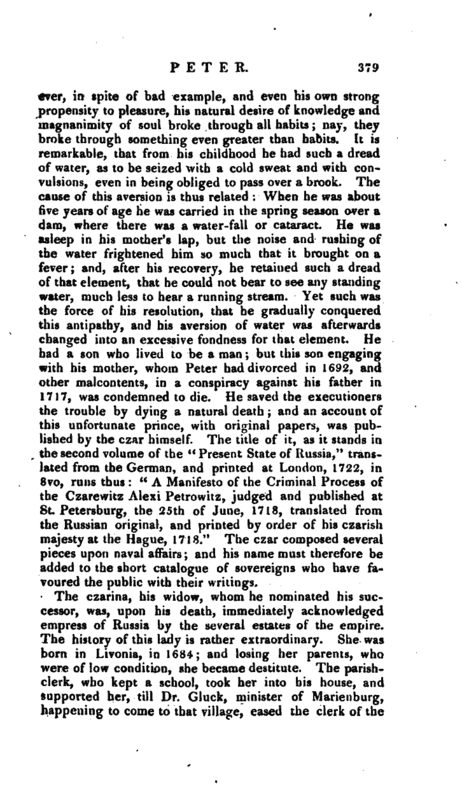 The title of it, as it stands in the second volume of the “Present State of Russia,” translated from the German, and printed at London, 1722, in 8vo, runs thus: “A Manifesto of the Criminal Process of the Czarewitz Alexi Petrowitz, judged and published at St. Petersburg, the 25th of June, 1718, translated from the Russian original, and printed by order of his czarish majesty at the Hague, 1718.” The czar composed several pieces upon naval affairs; and his name must therefore be added to the short catalogue of sovereigns who have favoured the public with their writings. Voltaire’s Hist, of Peter the Gr?at. Modern Universal History. Fontenelle’s Eloge. Coxe’s Travels. Tooke’s Rusiia.